As you plan a trip to Hendricks County, you may want to include a stop in nearby Martinsville, Indiana, to enjoy homemade candy. On the west side of the Morgan County Courthouse Square, you will find the Martinsville Candy Kitchen, 46 N. Main St. The Martinsville Candy Kitchen is a new member of the Rural Routes to Main Street Cultural Trail expansion into Morgan County. If you are not familiar with the trail, it’s a self-directed driving tour of local shops and artisan studios. When I walked into the store, I felt like I was taken back in time. 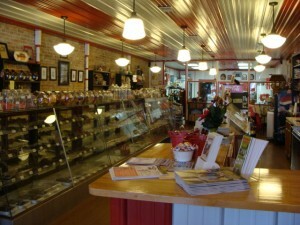 The store is long and narrow and lined with glass cases of candy on the left and ice cream freezers on the right. It is definitely a candy lover’s delight. 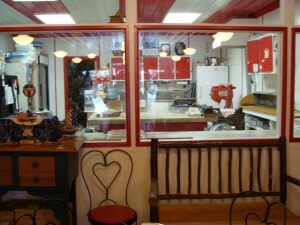 In the back of the store, a viewing window gives visitors a full-access look into the kitchen, though if you want to see activity you should call ahead to make sure they are making candy the day you plan to visit. 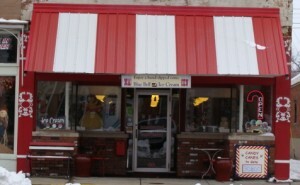 The Candy Kitchen was founded in 1919, a couple of stores down from the current location. 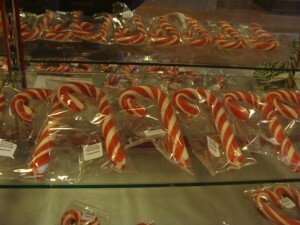 Since that time, their specialty has remained candy canes, but you don’t have to wait until the holidays to enjoy one. They make candy canes year round, along with a large assortment of other candies. My daughter and I enjoyed a candy cane and chocolate. Both were delicious and worth the visit. You are invited to watch the candy-making process, but as I stated above, make sure to call ahead before your visit. Saturday 10 a.m. -5 p.m.